The Rebel Sweetheart. : Wordless Wednesday #30 | Because Stone Cold Said So. 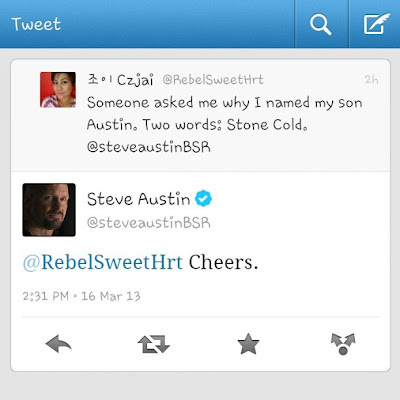 Wordless Wednesday #30 | Because Stone Cold Said So. I can't seem to use your linky - sorry - it won't open. Hope you'll stop by mine at http://www.acts17verse28.blogspot.com/2013/03/hang-on-springs-coming.html. How cool is that! I'm sure that really made your day! Super cool he'd tweet back!